I entertained a girlfriend last week for lunch, whom I used to teach with some years back, when we were kiddoless and wild single young things. We now rarely ever see each other, as we live on opposite sides of town, but our daughters are similar ages and we always have a great time when we catch up. This time it was over a bowl of my Asian Prawn Dumpling Soup. Being right on the doorstep of Asia, Australian cuisine has embraced their wonderfully rich food culture and it is very likely that if you were a guest to dinner in an Australian home, there would be some Asian culinary influence to the meal. It's lightness suits our climate and it is breathtakingly healthy and interesting. 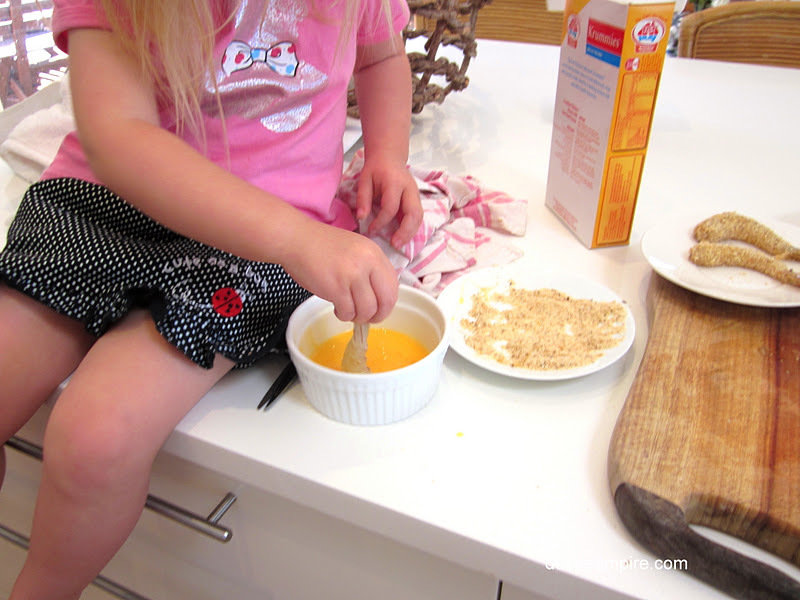 Now I admit, I am a wanna be gourmet cook and I have some way to go, but this one is pretty easy and it is sure to impress your friends. 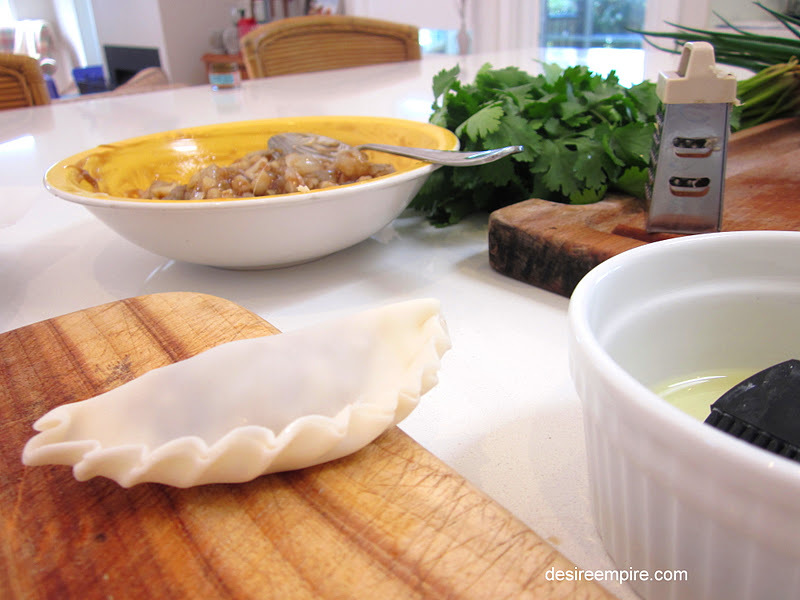 The trick with the dumplings is not to over fill it and then in sealing up the little baby. 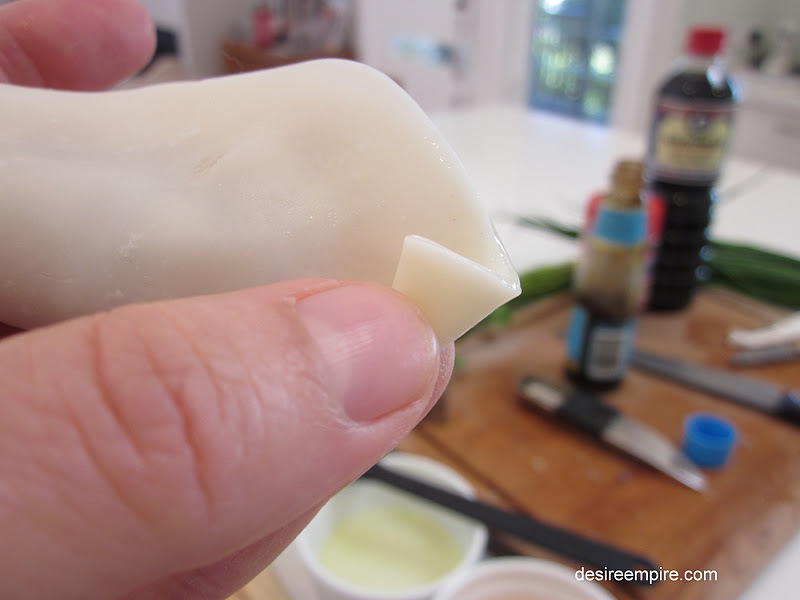 It's all in the first fold and if it looks like this, you are well on your way to making a very good dumpling. Funnily enough, my first one was my best. Kind of like being nervous when you do a driving test. If you are nervous you usually take care and pass, once you relax and think you have it in the bag, then that's when you stuff up. You can see here, that not all my dumplings were that uniform, but they all stayed together when they were cooked in the stock and came out beautifully shiny and whole. I made the stock as well, which meant I knew what was in it and it just tasted superb. We had a few prawns left over, so the Beach House Brat was left to egg and breadcrumb them while I finished off the soup. She and her brother had them that night for dinner. 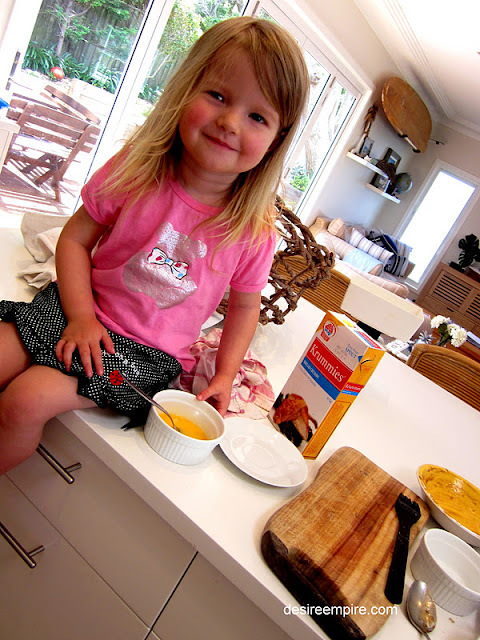 I don't think you can start these little babies too early in the kitchen and she really loves to help. I just love to hear celebrity chefs say they learnt to cook at their mother's knee. To me that is one of the great pleasure in life, sharing good food with people you love. I must admit my kiddos still resist vegetables, so I find I just give them what they will eat and hope their palette will develop so that one day, they will eat anything just like their mummy. 1 tspn finely chopped ginger. I grated it. 16 wonton wrappers. These are available in the fridge at any Asian supermarket. 4 cups good quality prawn or vegetable stock. 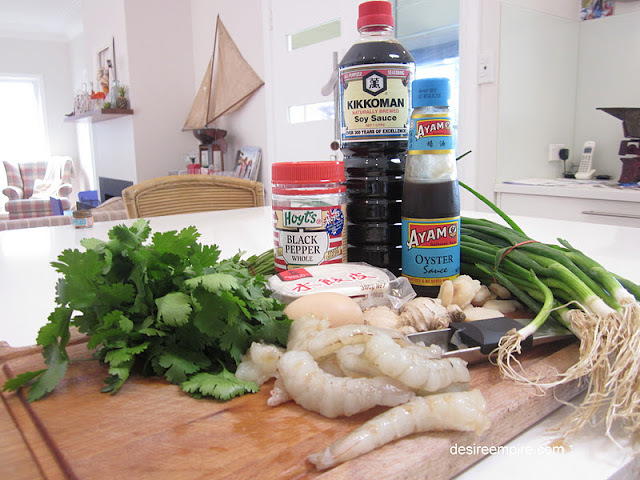 See the recipe for prawn stock below. 1. Combine the prawns, water chestnuts, oyster sauce, coriander, ginger and mix well. 2. 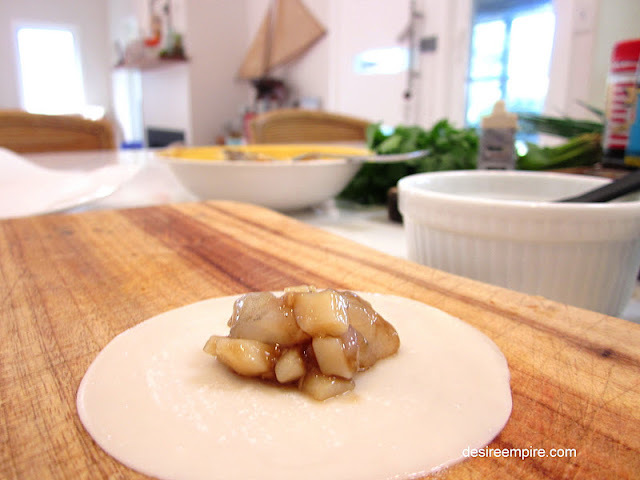 Lay wonton wrappers on a bench and lightly brush with a little egg white. 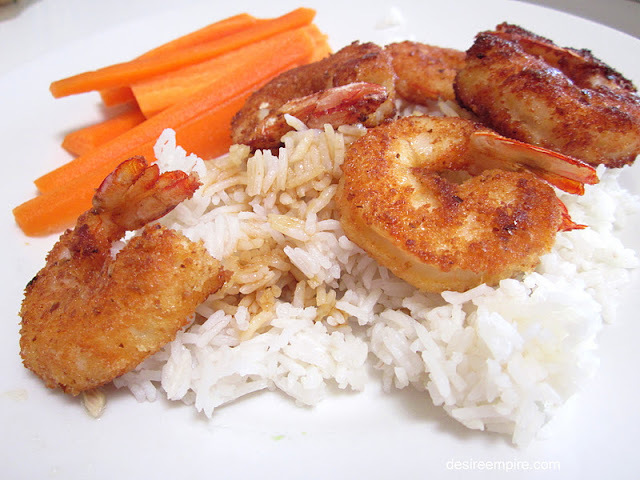 Place a small spoonful of prawn mixture in the centre. Make into a half moon and press edges in little folds to seal as per my photos. 3. Bring stock and soy sauce to the boil and a large saucepan over a high heat. 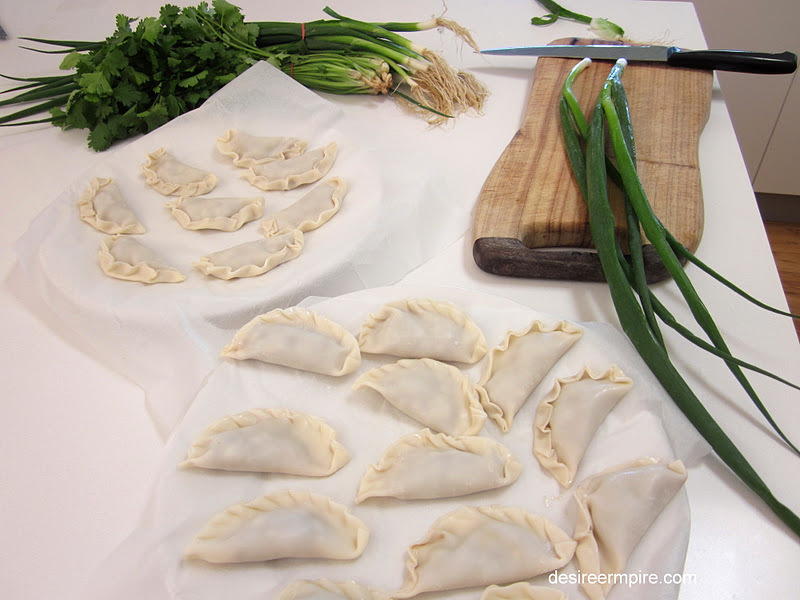 Lower heat slightly and add dumplings in batches of 4-6 and cook for three minutes. Gently pull the dumplings out with a slotted spoon. Serves 4 as an entree or 2 as a meal. 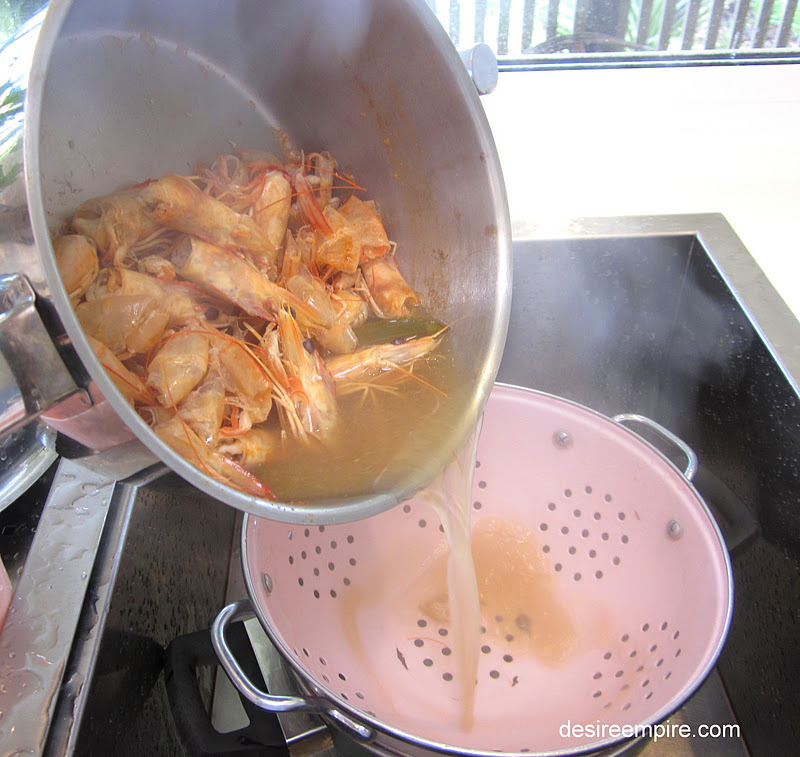 Brown the prawn shells and heads in a small knob of butter in a saucepan. Add 5 cups of cold water, 1/4 cup of dry white wine ( I used rose) and 6 black peppercorns. Simmer 20 minutes then strain. yum!! sounds fantastic and the crumbed ones don't look bad either. 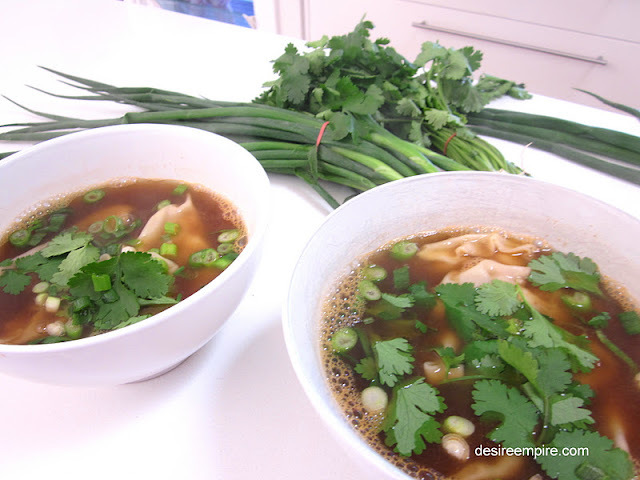 My son just loves asian wonton soup, and it's healthy! Win win. Yours looks great. You made me so hungry. This looks delicious. I am so hungry now.(smile). My favorite dish. I always buy them. I shall try to make it at home. Thank you for sharing. Oh yum - Asian inspired food is my all time favourite and anything with prawns top of the list. This looks fresh, healthy, flavoursome, diet friendly and delicious. My lamp chops for dinner are looking pretty average in comparison! That looks so good!!! I am pretty sure that I can't do that, mine would just wind up as balls. lol!! :) Love that the kids love to help too and glad that you had a good time with your friend! This looks like quite an undertaking, but the result seems very worthwhile and I'm betting it's a real winner. My hubby would love it. Seems your a blooded Asian, huh? Is it wonton soup? Now am drooling and really missing home (Philippines). She is so cute!!! And I love the name of the bread crumbs...Krummies (I think the box says). Love reading your blog and I am your newest follower! I love dumplings! I'm going to try this! First time on your blog and I came via Retired and Loving it (she's a sweet person). 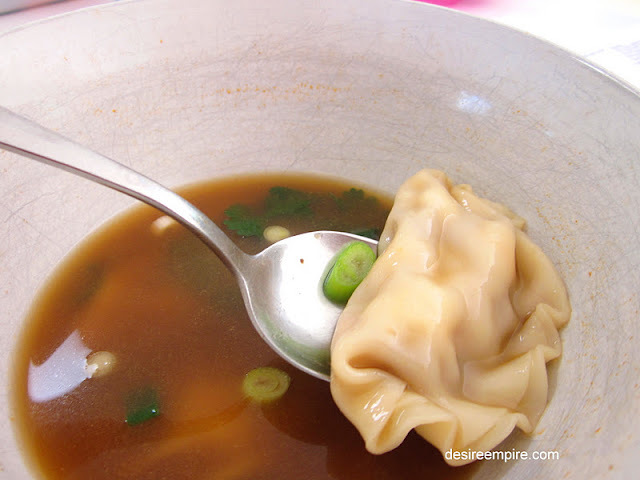 It's much the same as the wonton soup I make...but dumplings are so yum!